Anthony M. Frabizzio, is a partner with the Wilmington law firm of Heckler & Frabizzio and concentrates his practice on the defense of workers’ compensation matters for carriers and self-insured employers. He graduated from Salesianum High School, obtained his B.A. degree from the University of Delaware and his J.D. degree from Dickinson School of Law. 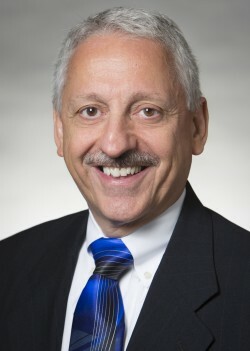 Mr. Frabizzio is a past Chair of the Delaware State Bar Association’s Section on Workers’ Compensation and is presently serving on the Workers’ Compensation Oversight Panel, Data Collection Sub-Committee and Fee Schedule Sub-Committee. He previously served on the Governor’s Workers’ Compensation Task Force and is a member of the Defense Counsel of Delaware, Delaware State and American Bar Associations. He has received the Community Service Award from the Delaware Bar Association. Mr. Frabizzio is a past Deputy Attorney General for the State of Delaware and has lectured on workers’ compensation for seminars sponsored by the Delaware State Bar Association, the Industrial Accident Board of the State of Delaware, and professional organizations. Anthony Frabizzio enjoys spending time serving his parish and community. He is actively involved in St. Anthony of Padua parish serving as a Trustee from 2010 to the present; Parish Council from 2004 to the present; Eucharistic Minister from 2000 to the present; Lector from 1999 to the present; Parish Planning Commission 2014; past Chair of Continue the Legacy Capital Campaign and past Chairperson of the Italian Festival (8 years). Mr. Frabizzio is also a founding member of the Columbus Day Communion Breakfast Committee serving as past and present Chairperson. He has served on the Delaware Adult Protective Services Advisory Board from 1989 to the present and has been a Friend of Wilmington Library from 1989 to the present. He has also served as a Big Brother for 9 years in that program. Mr. Frabizzio is a fan of the Philadelphia Flyers’ and has been a season ticket holder for over 30 years. He also enjoys traveling, particularly to Italy and New Orleans. He was also a member of the Small Firms Softball Team for many years.